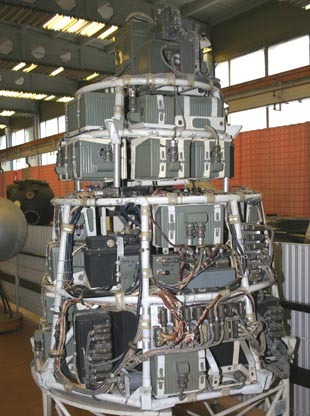 The orbiting physics laboratory, Object-D, was originally planned to be the first Soviet satellite. 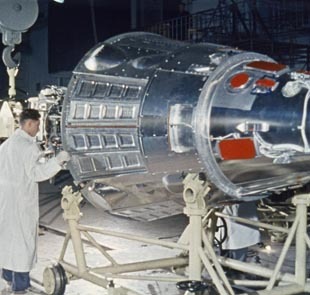 Preliminary plans for it were complete by July of 1956, but the construction and testing of the spacecraft and a dozen scientific experiments required almost two years, and so it became Russia's third satellite, known in the West as Sputnik-3. Following Sputnik-1 and Sputnik-2, America launched its first three satellites; Explorer-1, Vanguard-1 and Explorer-3. These were small simple satellites, weighing less than 14 kilograms. However, the Explorers, which carried a Geiger counter, would make an important discovery. Object-D was a cone-shaped satellite 1.74 meters in diameter at the base and 3.57 meters long. Weighing 1327 kilograms, its launch caused additional dismay among Western strategists as they upgraded their estimates of the R-7's capability. A magnesium alloy frame carried 968 kg of electronics, physics experiments and high-density chemical batteries (silver-zinc). It was covered with a polished aluminum skin and filled with inert nitrogen gas. Soviet engineers by this time were well advanced in the methodology of systems management. On the exterior of the spacecraft, red tape and covers protect delicate sensors. The removal of these covers just before launch was formally checked, and every red item accounted for in a special report. The internal equipment of Object-D shows standardized packaging and specially designed connectors used in all rocket systems. Academic teams in charge of specific experiments were given specifications of power and telemetry system interfaces. A thermal control system was needed to deal with heat from the Sun and from the internal electronics. 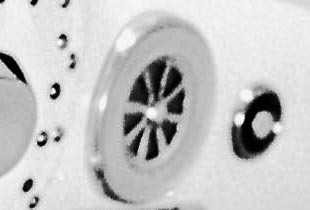 A fan circulated the satellite's internal nitrogen atmosphere, and 16 shutters on the side opened or closed to control the amount of heat radiated into space. Pressure hulls filled with atmosphere would be a standard feature of Soviet spacecrafts, unlike American probes and satellites which were generally open to the vacuum of space. Many of the telemetry systems from the R-7 were adapted for Object-D, their modified version signified by a "-D" suffix. Binokl-D was a centimeter-band range system using onboard transponders that actively returned a radar signal. 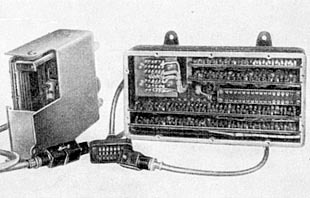 Irtysh-D was a decimeter-band interferometry system for angular tracking, and Tral-D was the multiplexed telemetry system using pulse-width modulation on a 66 MHz shortwave frequency. Some data was also sent on an unclassified 20 MHz frequency, sent from a special 0.25 watt transmitter called Mayak. 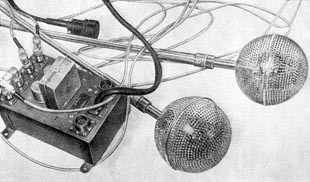 Object-D could also receive radio commands from Earth. 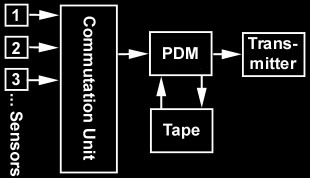 The analog science data was multiplexed in round-robin order by a commutation unit, and then modulated into a pulse-duration signal, by the Tral-D telemetry system. 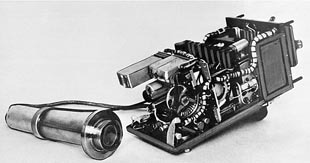 A tape recorder would allow playback of data from parts of the orbit beyond the range of Soviet receivers. 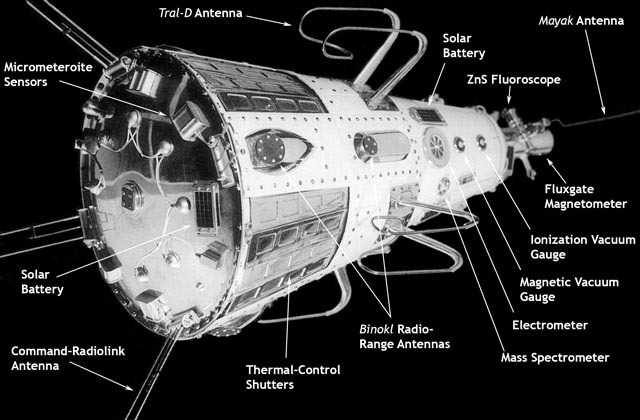 Scientific instruments included a magnetometer and field-mill electrometer to measure fields in space, four space radiation detectors to study cosmic and solar particle radiation, a mass spectrometer and two pressure gauges to analyze the rarified outer atmosphere, an ion trap to measure plasma, and a piezoelectric microphone to count micrometeorite strikes. Sputnik-3 could also be sent commands using the MRV-2M system, to alter the behavior of its program timing unit. 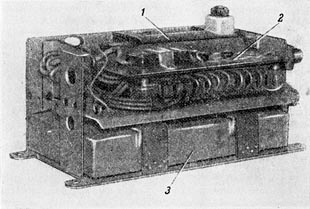 This was a "modernized" -- transistor based instead of vacuum-tube based -- version of MRV-2, a remote mine detonation system (Minnyi Radio-Vzryvate). Using 12 frequencies, 47.9 to 49 MHz, commands were coded as pairs of frequencies transmitted simultaneously. 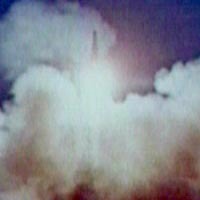 The first attempt to launch Object-D was at 9:01 GMT, April 27, 1958. Unfortunately, pogo oscillation of the propulsion system caused the rocket to fail 88 seconds into the mission. A backup copy of the satellite was launched on May 15 at 7:00:35.5 GMT. It achieved an orbit with a perigee of 226-228 km, apogee of 1880 km, and a period of 105.95 minutes. The plane of the orbit was inclined 65.18°. The sustainer stage reentered the atmosphere on December 3 of that year. Sputnik-3 remained in orbit until April 6, 1960. The onboard experiments were powered by batteries and worked for a week to one month. 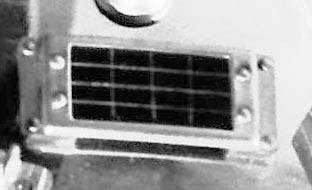 Experimental silicon solar batteries were able to power the 20 MHz Mayak transmitter and Sergey Vernov's scintillation counter, and these functioned for the entire lifetime of the satellite. Over the next two years, data about cosmic rays was gathered, and the Mayak signal was used by Russian scientists to test the Lunar telemetry systems. The Mayak signal can be heard here (courtesy of Sven Grahn). Some ham radio enthusiasts believed the satellite was transmitting the Morse code for the letter "L", but in fact the signal was encoding information from the cosmic-ray counter. A 0.3 second synchronization pulse was followed by a long or short pulse, indicating whether the system was running on chemical or solar battery power. The next two pulses encode data from the scintillation counter. In May of 1958, the same month as the launch of Sputnik-3, the American physicist James van Allen announced that the Explorer-1 and Explorer-3 satellites had discovered a region of intense radiation high above the Earth. 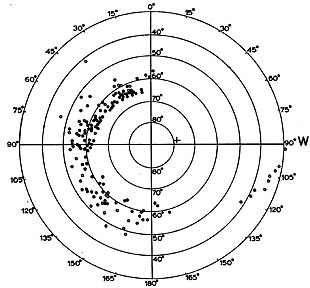 When their elliptical orbits took them above 700 miles, the Geiger counter rate increased 1000 times. At the time, the structure of this radiation was not known. Today, we can see exactly what was happening in the accurately scaled diagram above. American satellites, launched from a lower latitude, usually traveled in an orbit inclined 33°. This took them in and out of the inner radiation belt, and a world-wide network of friendly receiving stations permitted them to measure results at many points along the orbit. Soviet satellites generally had an orbit inclined by 65 degrees. Over Soviet territory, Sputnik-2 and Sputnik-3 passed through the rim of the more powerful outer radiation belt. This explained higher levels of radiation seen around 60° latitude. A few months later, America launched Explorer-4 with a more inclined orbit so they could also study the high-latitude phenomenon (and monitor American military experiments with nuclear weapons in space). 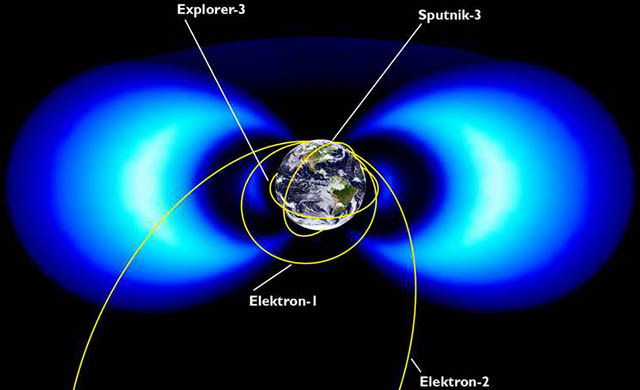 More was learned about the structure of the radiation belts when the failed American Lunar probe Pioneer 3 passed through the outer belt, before falling back to Earth. The Soviet probes Luna-1, -2 and -3 also mapped this outer region, and they made the second major discovery of space science: the solar wind. Geophysicists had long speculated about possible causes of the polar auroras. 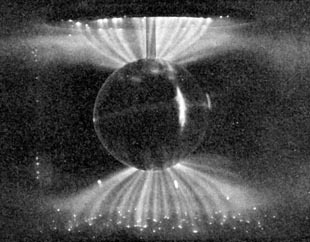 Around the turn of the century, Norwegian scientist Kristian Birkeland attempted to simulate auroras in the laboratory using magnetic spheres and cathode rays (see image above). Geophysicists were aware of the idea of geomagnetic trapping of charged particles, but Vernov (a nuclear physicist) probably did not know about it and was not receptive when Russian geophysicist Vladimir Krassovsky tried to raise the idea. Van Allen combined experiment with the correct theory, and the radiation belts were named after him. 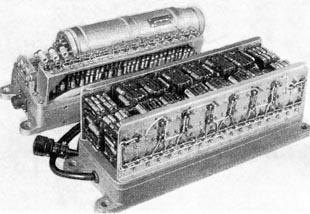 Vernov had chosen to use the Mayak transmitter to send his scintillation counter data on a publically known channel. This was fortunate, because the tape recorder system on Sputnik-3 failed, and he was unable to gather data from an entire orbit. From stations in the Soviet Union, England and Alaska, he was able to gather real-time data in the north polar region. Data gathered from May 15 to June 18 is shown above. After this time, there was a partial failure of the telemetry electronics, but cosmic-ray data was still available. In the southern hemisphere, measurements made at the Soviet Antarctic base and in Australia shows a similar polar zone of radiation, even more intense where the satellite was higher up, near its apogee. In September, the science vessel Ob was able to record signals in the equatorial zone, off the coast of South America. There, Sputnik-3 saw the same inner-belt radiation measured by the Explorer satellites. 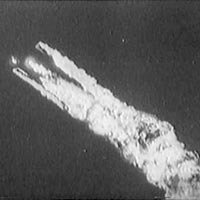 The tremendous payload capacity of the R-7 rocket gave Soviet scientists a temporary advantage over their American colleagues. Planned and built over a two-year period, the massive Sputnik-3 satellite was filled with complex physics experiments. Sh.Sh Dolginov, at the Institute of Terrestrial Magnetism and Ionosphere, had been involved in international efforts to map the Earth's magnetic field and understand the mechanism of its generation. He met with Korolev in the summer of 1956 as one of the principal investigators on the Object-D project. 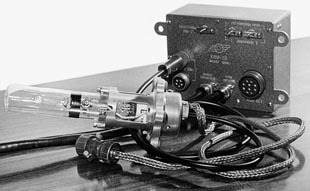 His SG-45 magnetometer was an iron core fluxgate type. Mounted on gimbals, it automatically oriented itself along the direction of the field. This gave information about the scalar intensity of the field, and about the orientation of the satellite. Sputnik-3 had no orientation control system, and it slowly tumbled with a period of 136 seconds. The device returned readings for a month, from May 15 to June 15 before running out of power. I.M. Imianitov built a rotary field mill to measure the local electric field. He found that the electric field above the Earth was 10 to 100 times as strong as predicted, and his device showed that the satellite acquired a negative charge while in space. Composition of the outer atmosphere and the interplanetary medium was studied by several experiments. K.I. Gringauz built an ion trap. Any plasma present in space would enter through a spherical screen and be subjected to an electric field. This would separate the plasma into negative and positive components and create a measurable current. Two spherical traps were located on the ends of booms that swung out from the side of the satellite during its deployment. Because the ion traps were spherical, they had no directional response. On Luna-1, Gringauz used hemispherical traps, which allowed him to discover that plasma was flowing past through space (the solar wind). V.G. 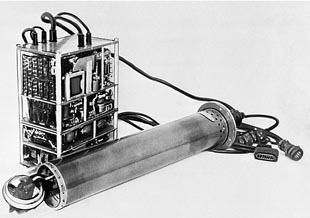 Istomin installed a model RMS-1, Bennett type radio-frequency quadrupole mass spectrometer. He found the outermost extremes of the atmosphere contained mostly atomic oxygen ions, and much less atomic nitrogen or molecular ions such as O2, N2 and NO. His instrument operated for ten days and recorded 15,000 spectra. Considered a master instrument builder, V.V. 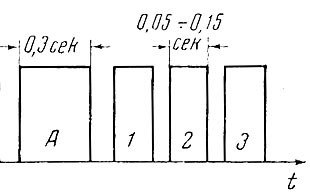 Mikhnevich developed two low-pressure gauges of types commonly used to measure high vacuums in laboratory chambers. In the ionization manometer, a hot tungsten filament ionized nearby gas, generating a small current when the ions flowed to a charged grid. These can measure pressures in the range of 1.0E-6 to 1.0E-9 mm Hg. The magnetic manometer could accurately measure slightly higher pressures. She installed two ionization gauges and one magnetic gauge on Sputnik-3. At a height of 266 km, the pressure was only 1/10,000 atm. T.N. Nazarova built piezoelectric detectors of micrometeorite impacts. This consisted of metal plates suspended by ammonium phosphate crystals. Micrometeorites arrive at velocities from 11 to 70 km/sec. On the 840 square centimeters of detector area, she detected an average of one impact every 100 seconds. The system functioned for 11 days, until May 26. N.S. 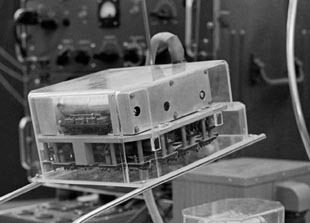 Liderenko built experimental silicon solar cells for Sputnik-3. Besides supplying power to the Mayak transmitter and Vernov's scintillation counter, Liderenko wanted to evaluate the long term effects of radiation and micrometeorite damage on solar batteries. Some of the batteries had the silicon exposed directly to space. Others had a polished glass cover to protect them from impacts, and others had a ground glass screen which would remain unchanged as micrometeorites etched its surface. While the Explorer satellites had contained a Geiger counter, Sputnik-3 used several different types of detectors to learn more about the composition and energy spectrum of charged particles in space. Cherenkov detectors are based on a Nobel-Prize-winning discovery, that relativistic charged particles create a wake of light when they pass through transparent matter. This is the familiar blue glow seen around underwater atomic reactors. L.V. 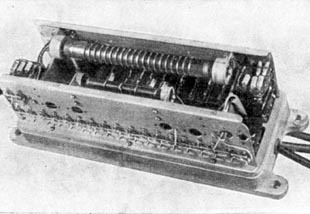 Kurnosova's Cherenkov detector used a photomultiplier tube to measure flashes of light from a clear plastic detector. Since this effect increases by the square of the electric charge of the particle, it is well suited for measure the rare heavy-nuclei component of cosmic rays. Her experiment reported two counts, for particles with Z ≥ 15, and for Z ≥ 30. It operated for 9 days. Geophysicist V.I. Krassovsky installed a pair of zinc sulphide scintillation counters to measure low energy electrons in the range 10 to 40 keV. The two detectors had screens of different thickness to discriminate different ranges of energy. Krassovsky was familiar with the theory of geomagnetic trapping of ions, and he expected to see the effects of this. Unfortunately, his device was frequently overwhelmed by radiation, and it took him considerable time to analyze and publish his results. S.N. Vernov and A.E. Chudakov designed two cosmic-ray detectors. One was an improved model of the Sputnik-2 detector, containing SI-17 and STS-5 gas discharge tubes. Results from this detector were not useful, unfortunately, and were never published. Vernov and Chudakov also installed a scintillation counter using a thallium doped crystal of sodium iodide. Both a scintillation counter and a Cherenkov counter have a similar structure -- a photomultiplier tube picking up flashes of light from a clear detector. However, they utilized entirely different physical effects. Scintillation is light emitted when a material is excited by a collision with a charged particle or photon. The results of this detector have already been discussed above. 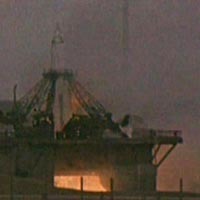 This experiment functioned for almost two years, until the satellite reentered the atmosphere.